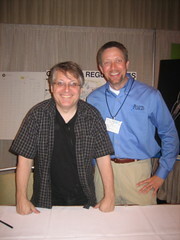 Scott McCloud just wrapped up his part of the final general session. He gave a quick overview of his Big Triangle. If you haven't read his books you should start with Understanding Comics. I have all of his books at home so I had nothing for the book signing. So I took a picture.